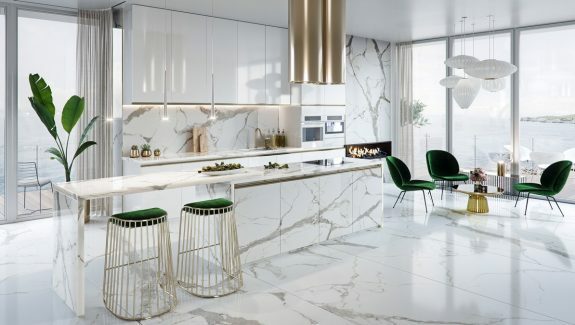 These three luxury home interiors use smooth white marble decor and golden home accents in a way that will make you green with envy. 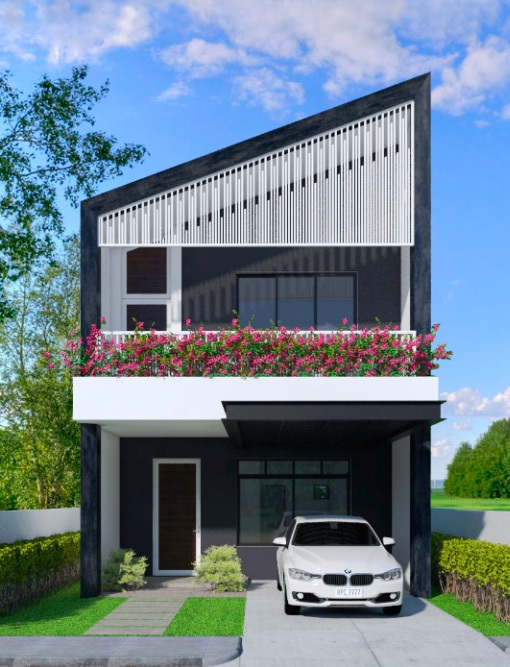 These are rather modestly proportioned properties, but the level of luxe makes them look like so much more. 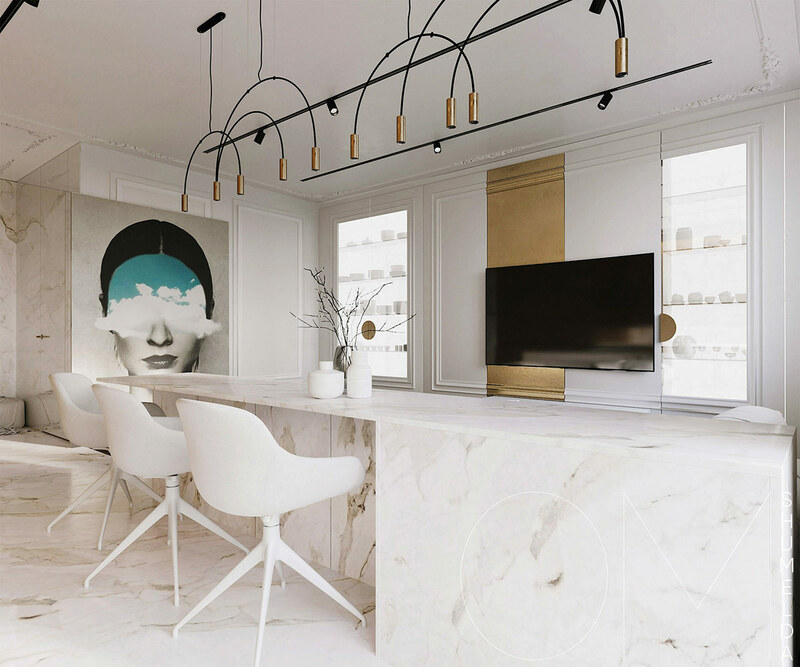 Whether it’s the high-end price tag of the materials, their light reflective properties, the interesting and prolific changes, or purely the amazing style in which they are applied that makes the magic, it’s hard to tell. 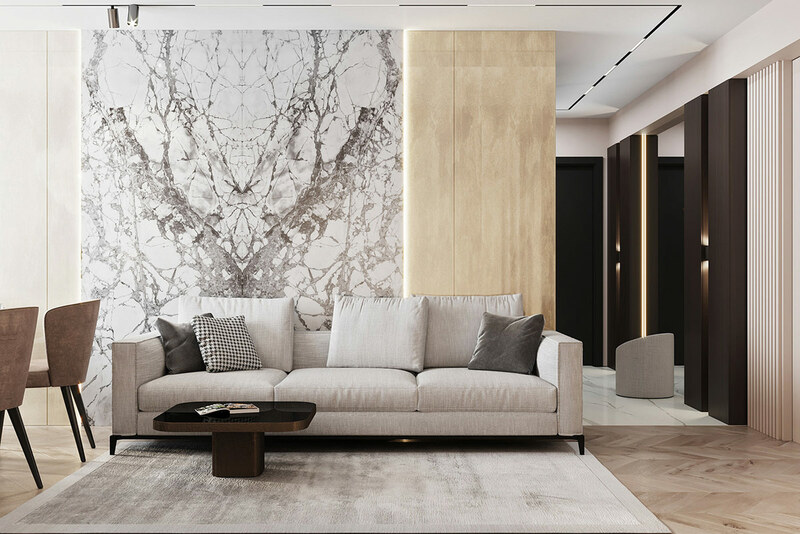 One thing we do know for sure is that there is heaps of upscale inspiration here to be tapped and applied to your very own spaces. Let’s get started. 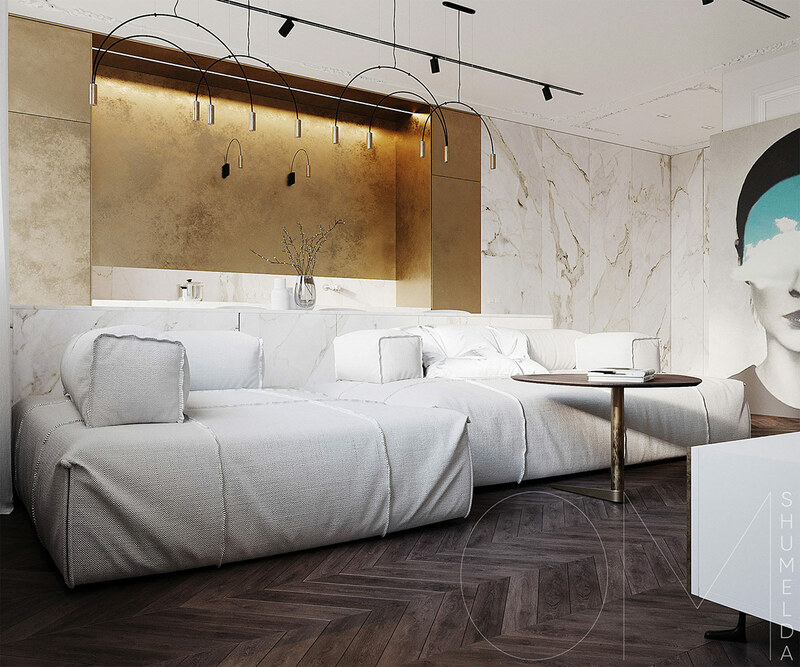 FIrst up is a luxe small interior scheme that was entitled ‘Golden Cloud’ by its design team. It’s easy to see why too, with a pillowy white sofa taking up the centre of the ‘cloud’, and golden streaks clustering at its borders. 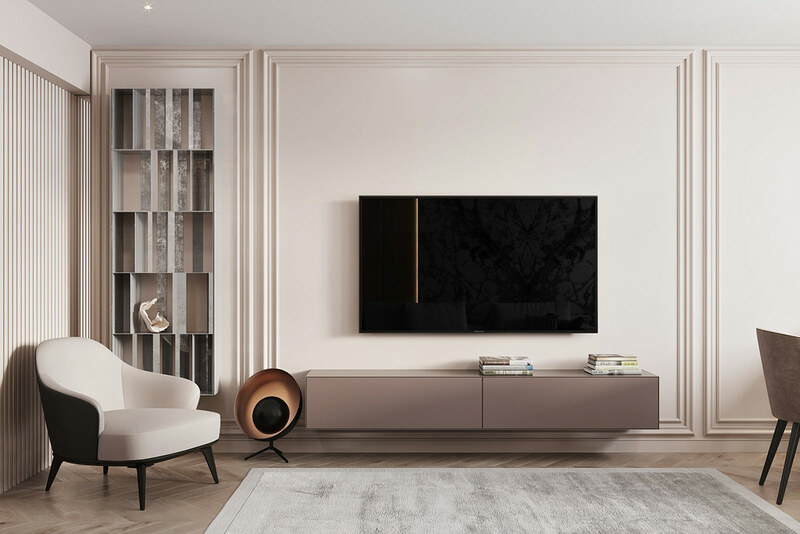 A golden tv wall has been fashioned by painting on a wide stripe of metallic paint from top to bottom – which overlaps panel molding and transfers onto a tv console unit. 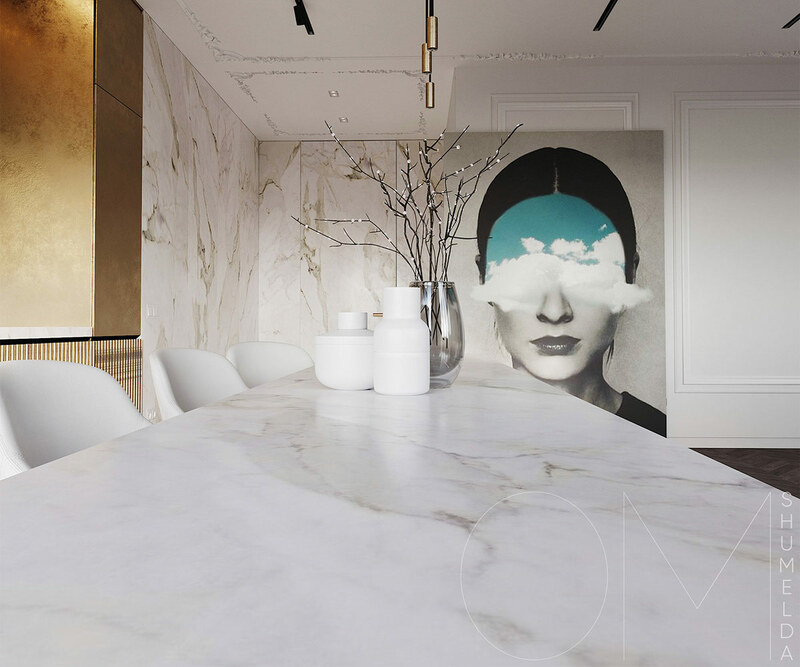 A dining peninsula runs through the centre of the open plan room. Each white swivel chair faces toward the tv in the lounge to enjoy casual dinner time entertainment. 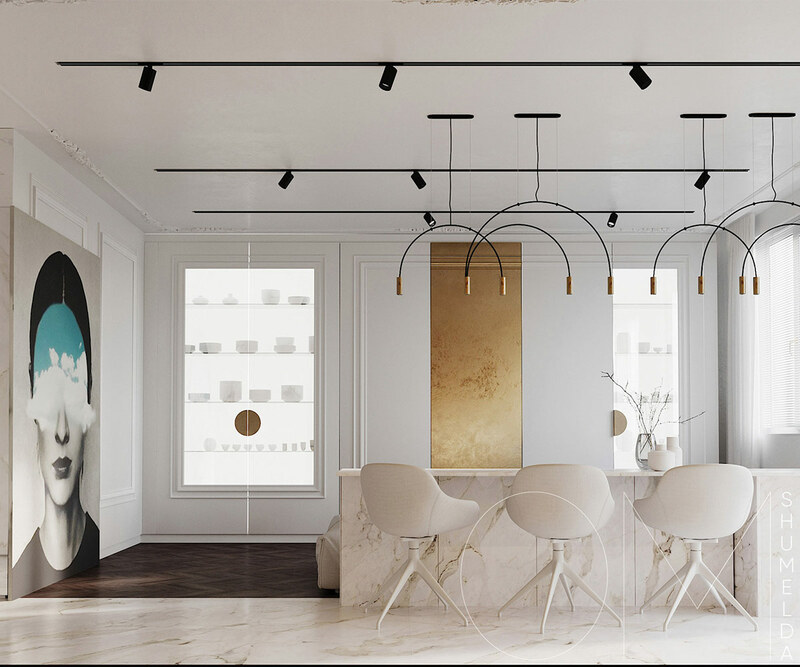 The modern chandelier design that repeats over the length of the peninsula is the Volta LED pendant. The elegant overlapping black arcs are tipped with gold. 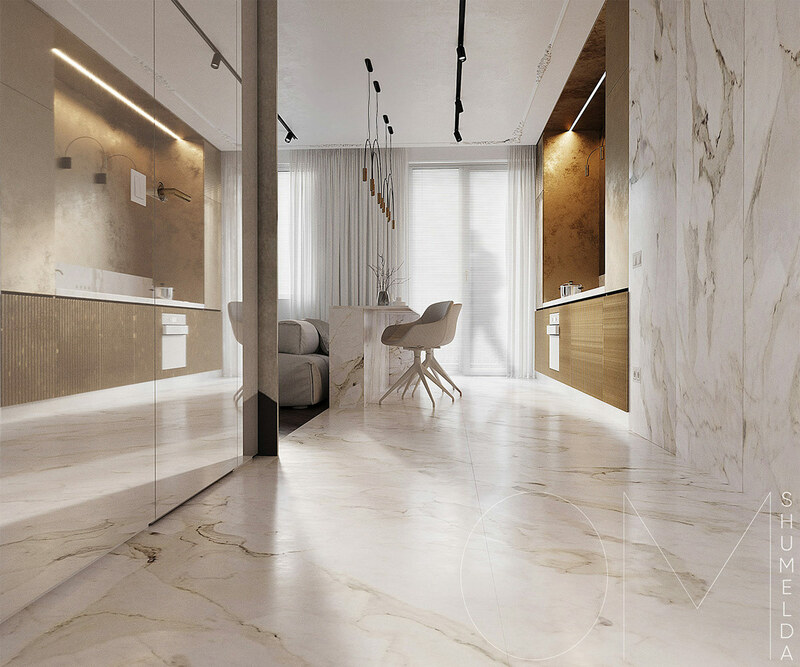 The white marble peninsula seems to extrude out of the matching marble floor. White decorative vases make a quiet table centrepiece, chic in its simplicity. 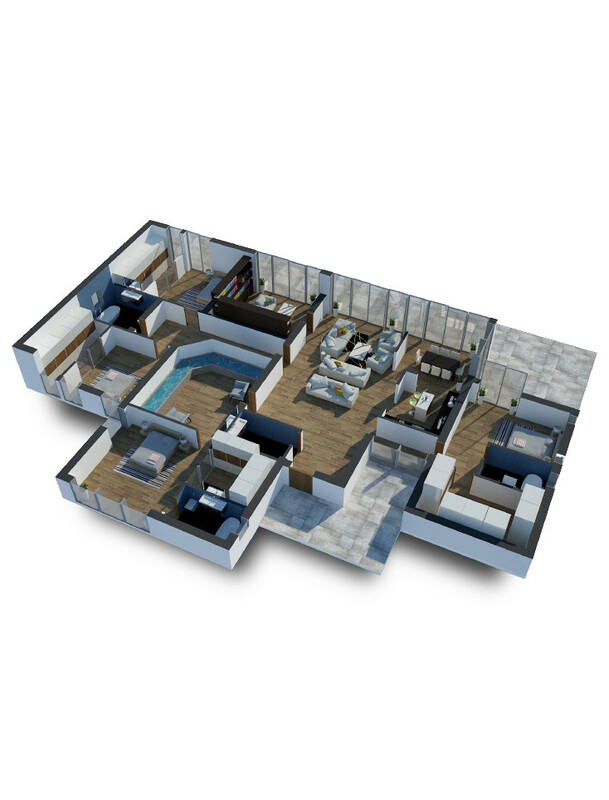 An enormous piece of modern art brings in a blue hue at one end of the main living area, and ties in with the cloud inspired design. 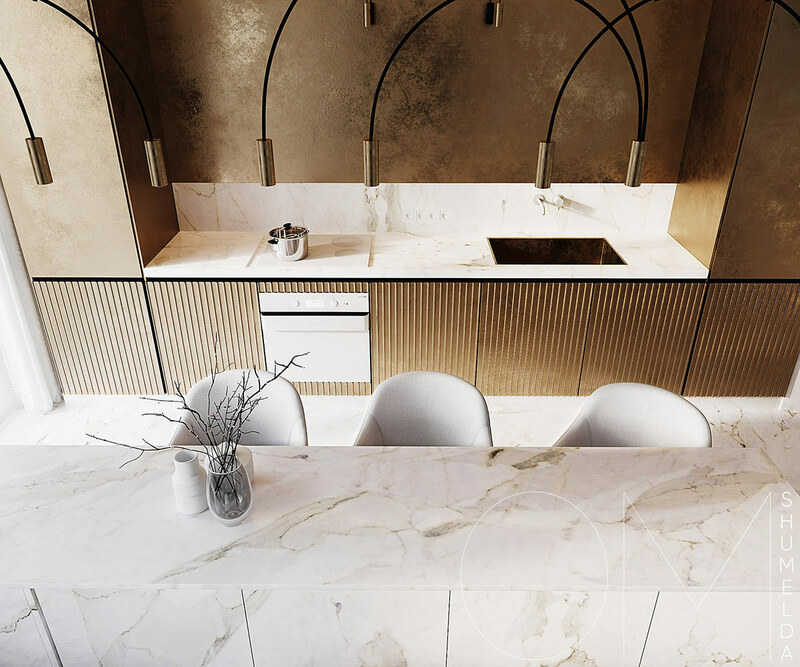 Textured golden cabinets form a one wall kitchen behind the dining table. The gold treatment covers the kitchen wall all the way to the ceiling too. Mirrored doors make the hallway seem wider and grander. 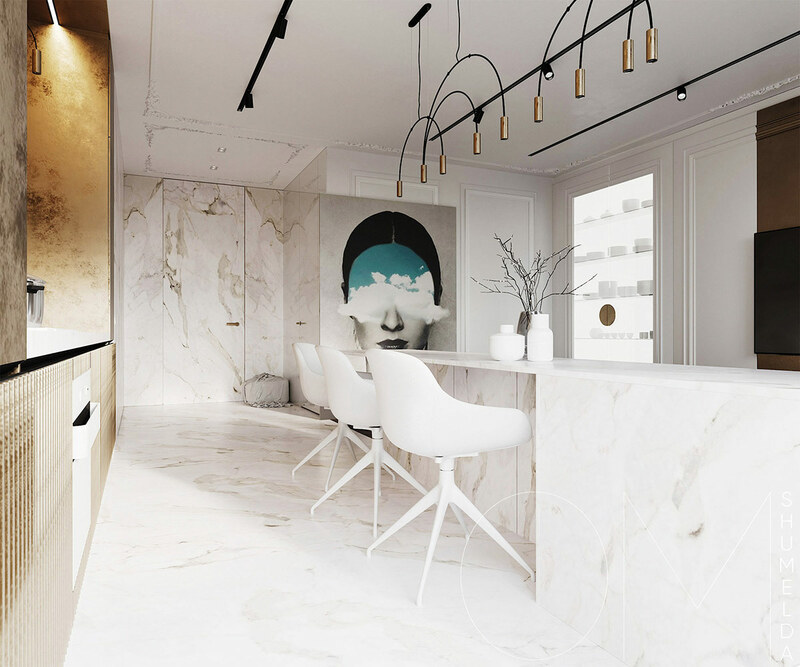 Naturally, white marble has also been used for the kitchen countertop and backsplash. 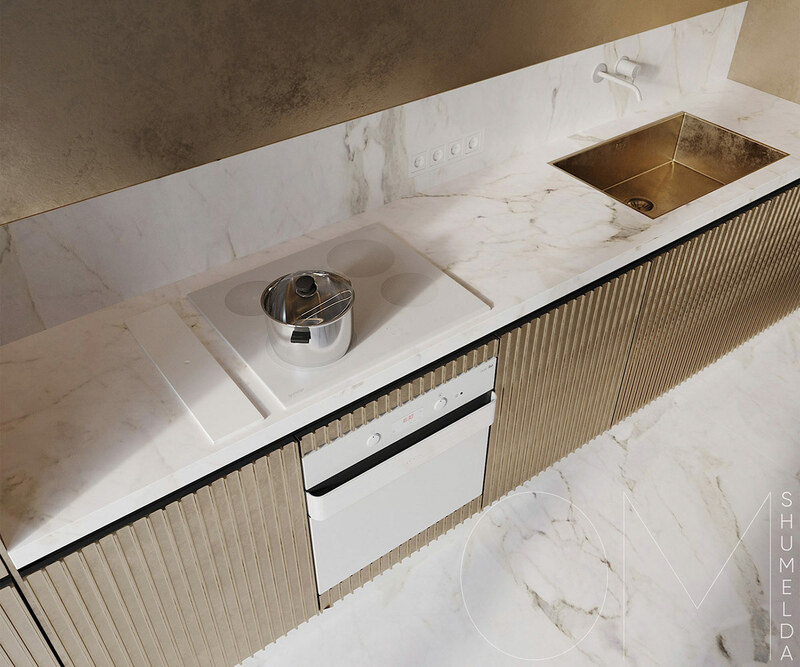 A gold kitchen sink shines preciously in the work surface. An integrated oven and hob have a white finish to complement the light surroundings. 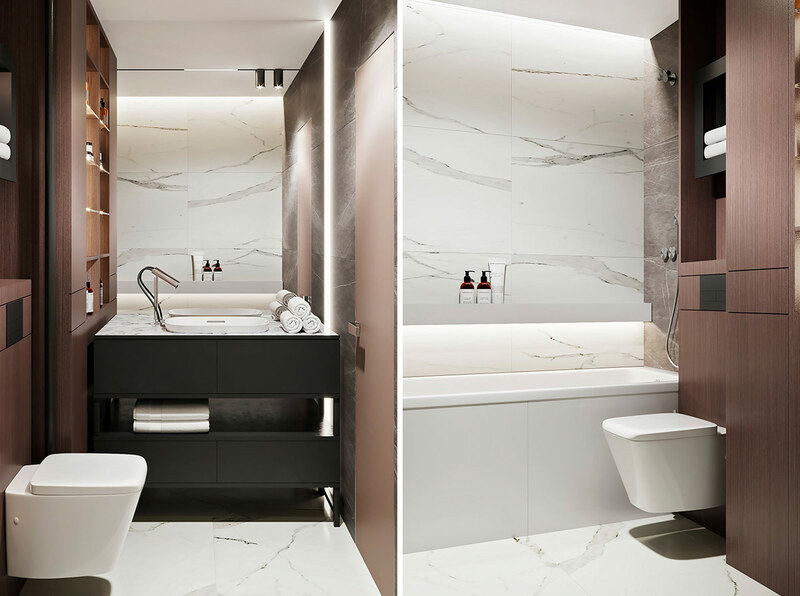 In the bathroom, a circular vanity mirror hangs above a white minimalist wall mounted vanity unit. 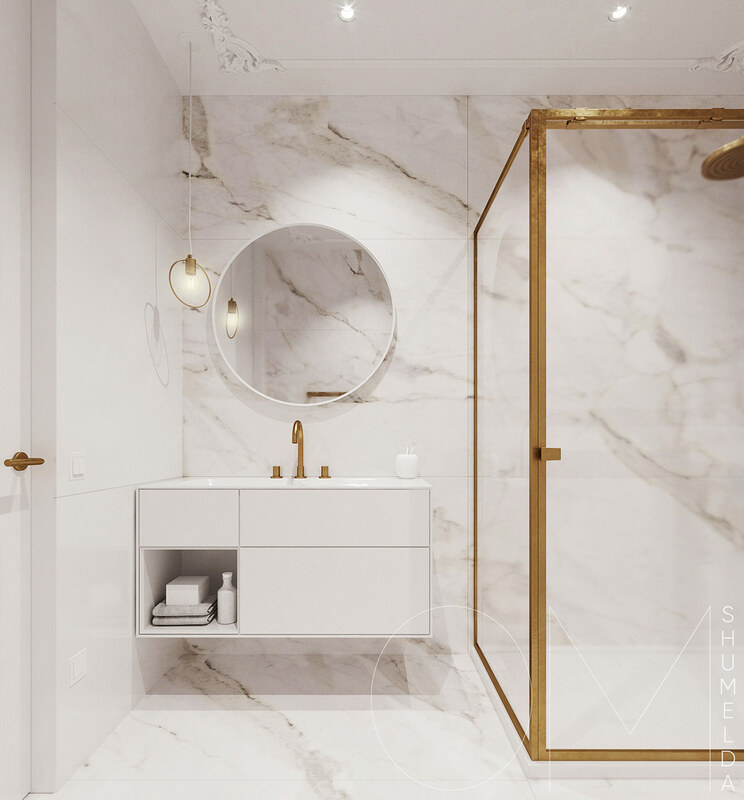 Gold trims the room in the form of a faucet, modern pendant light and shower enclosure frame. Gold towel rails climb the wall. 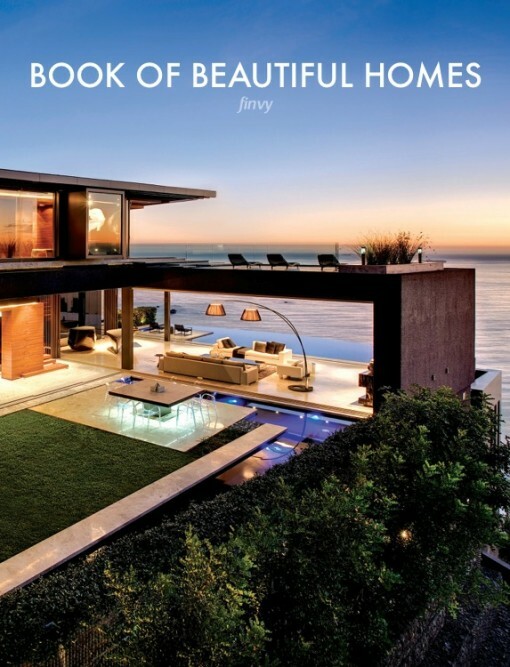 Our second tour is of a 58 square metre abode. 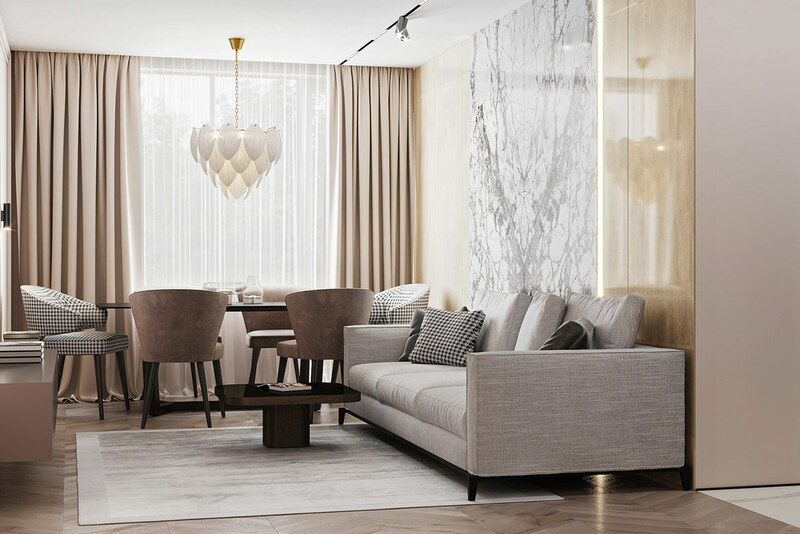 The lounge area is crammed right up against a dining set – yet the living space still maintains a high-end and enviable look. 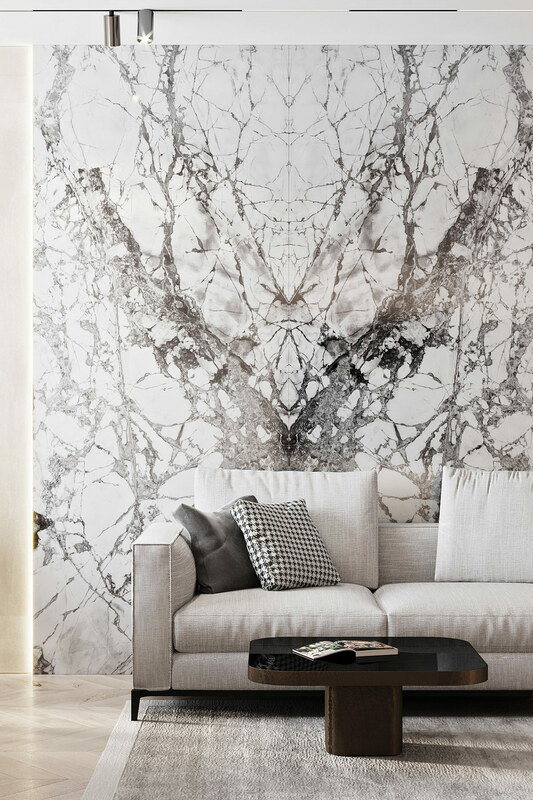 Bookmatched marble makes the biggest impact in this small space. Lighting around its perimeter makes it look even more special. The lounge chair has smooth contours that contrast beautifully against the linear nature of a slatted feature wall. Display shelves hang beside it, framed by traditional panel molding. The tv wall is centred within its own panel section. The soft single tone decor makes the small room feel airy. 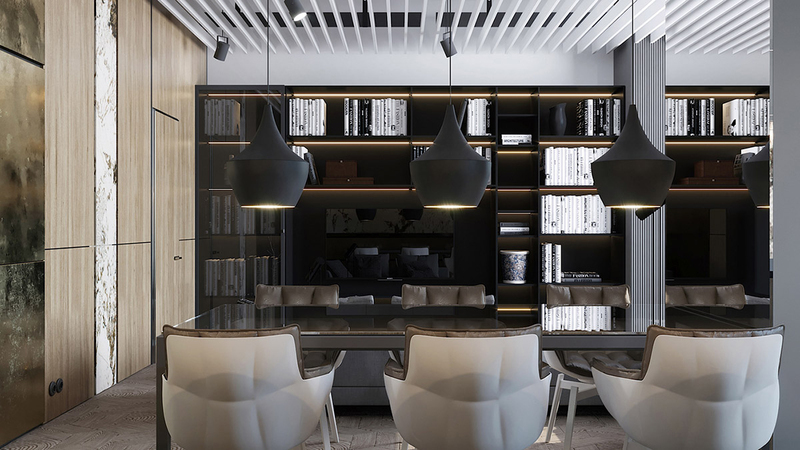 A sculptural pendant light bejewels the dining area at a large window. 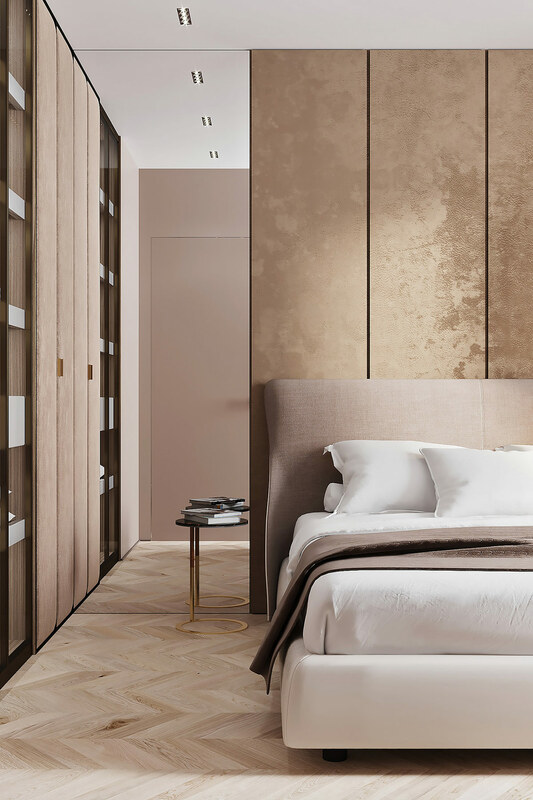 A golden headboard wall and gold ffloor lamp add luxe to a bedroom scheme. 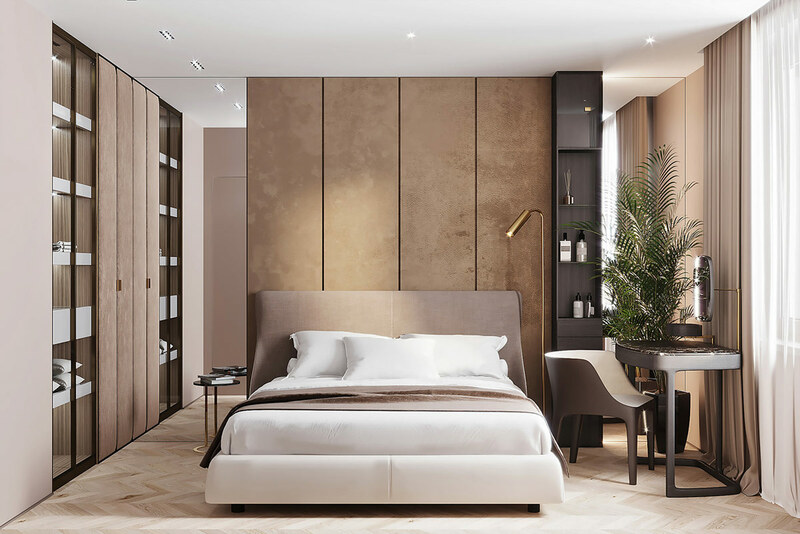 One small side table stands in front of a floor to ceiling mirror that makes the room appear twice its length. 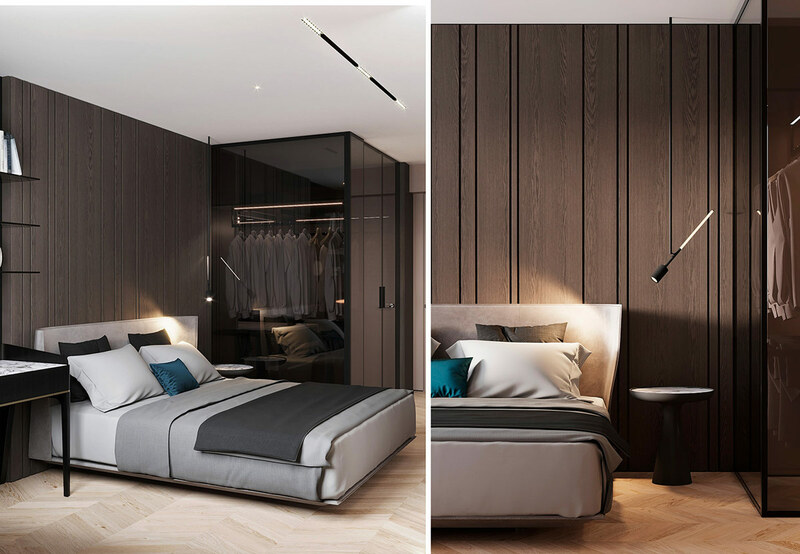 There is a frameless mirror on the other side of the bed too, which reflects an indoor plant and dressing table. 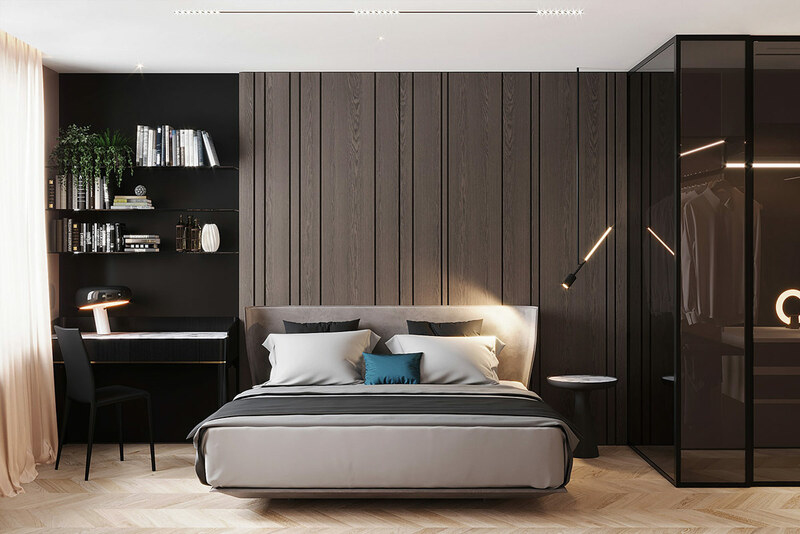 This bedroom design has a dark brown-black theme, with golden tones provided by the warmth of the bedroom pendant light and designer table lamp, which is the Flos Snoopy Lamp. 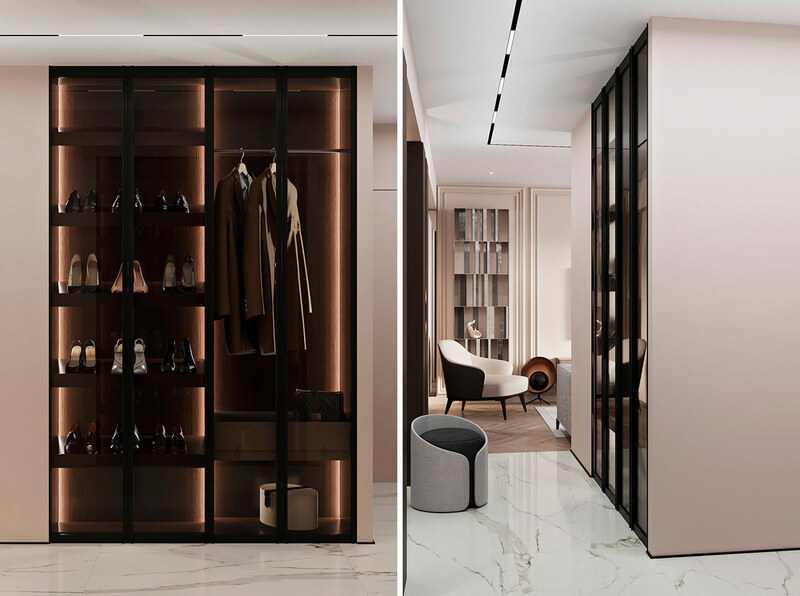 A glass closet occupies one corner. 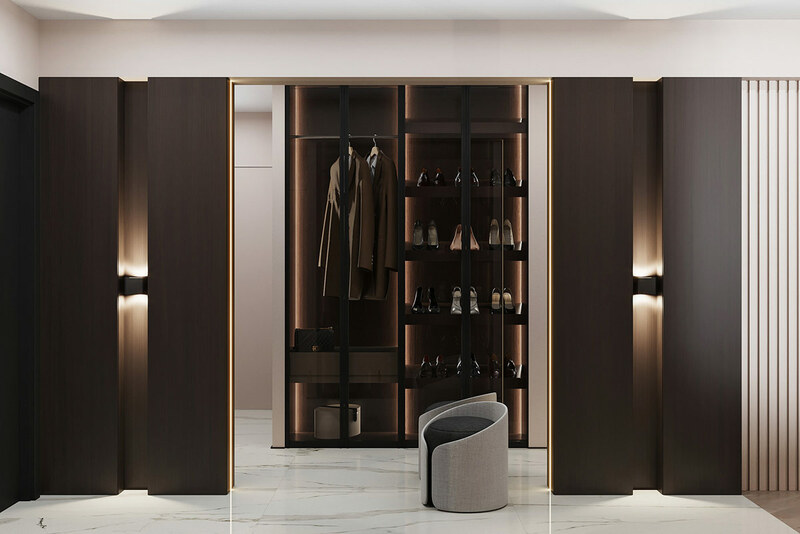 Outdoor coats and shoes are stored in a dramatic hallway closet. A modern stool waits by a huge mirror. 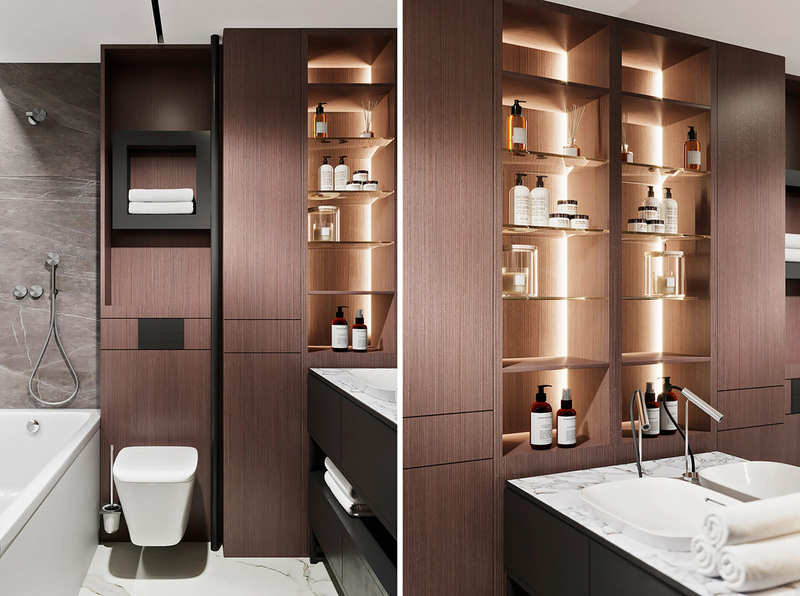 LEDs light the shelves in the bathroom. 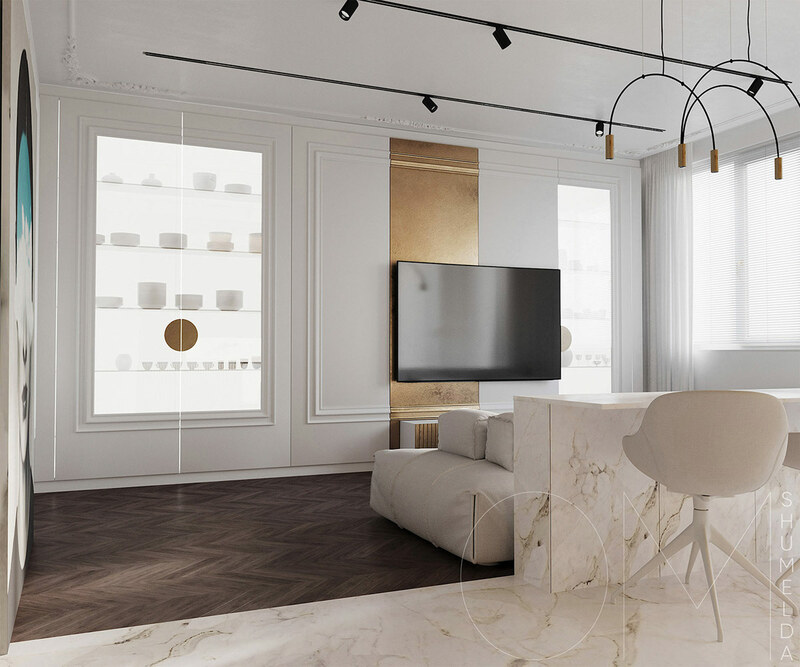 White marble clads the walls. 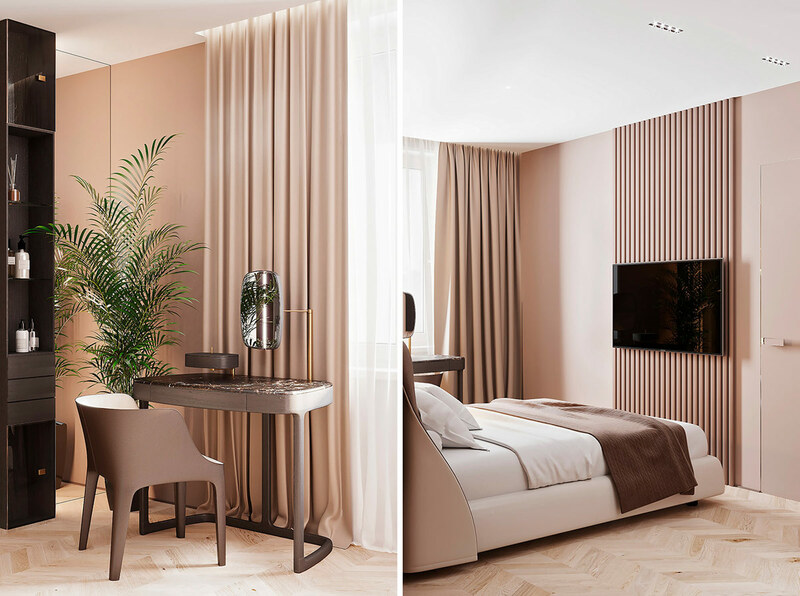 Our last luxe tour is a 150 square metre apartment, where designers aimed to blend tradition with technology. 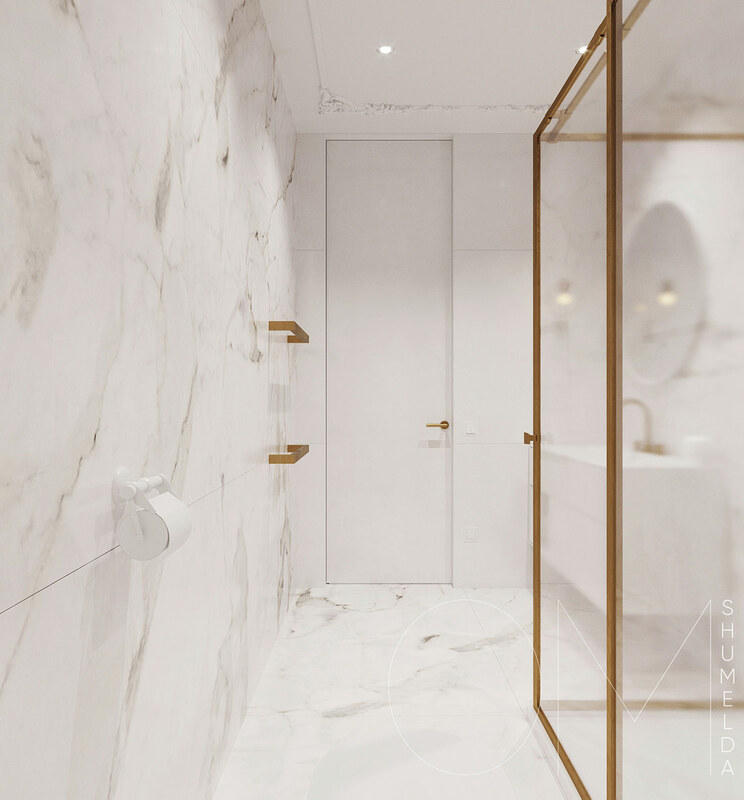 Wood, gold and stone have always been, and in using these natural elements there is a sense of belonging – even if a design is contemporary, or new tech surrounds us. 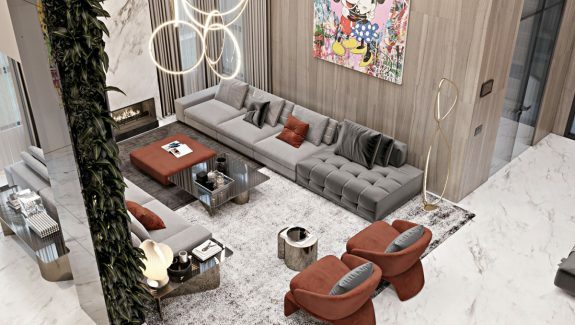 A sectional modern sofa is set out in unusual formation across the living room. 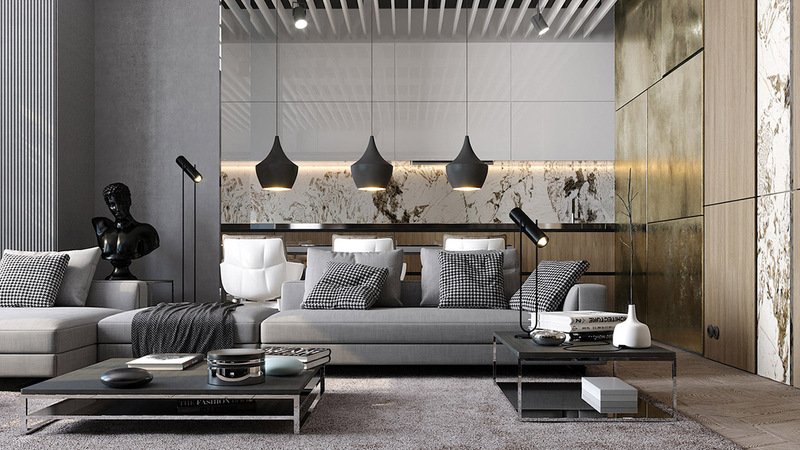 The sleek style of the sofa coupled with the unorthodox layout feels formal and casual all at the same time. 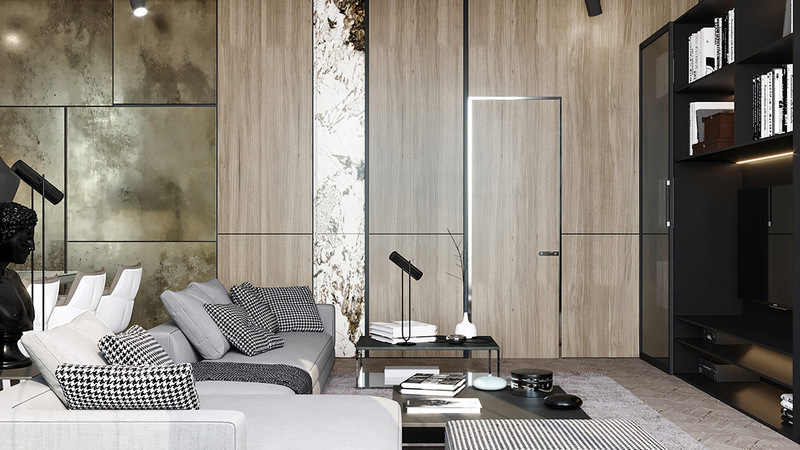 The wall is boldly sectioned into gold tile, wood panel and marble slab. 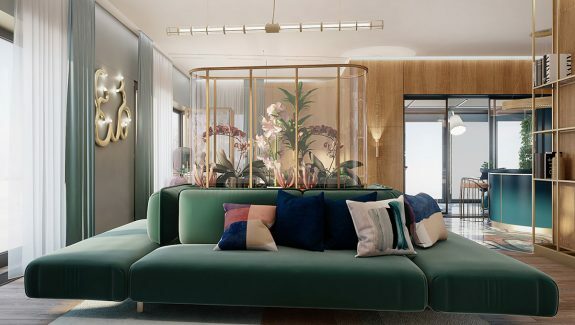 A dining spot is positioned in close quarters with the sofa. 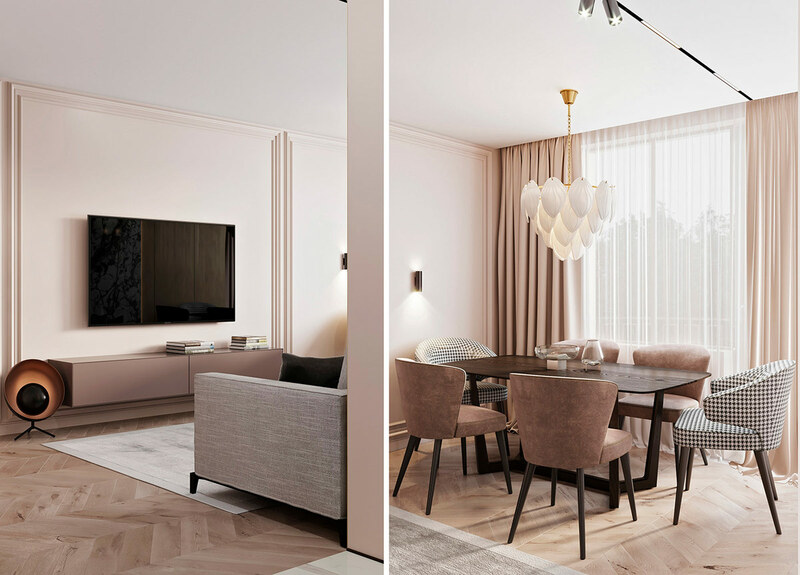 Three Tom Dixon style lamp shades clearly define the dining zone from the rest of the open plan. 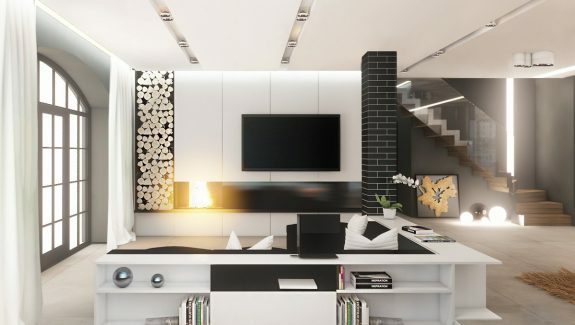 On the opposite side of the room, tall black storage units with smoked glass doors span the wall around the tv. 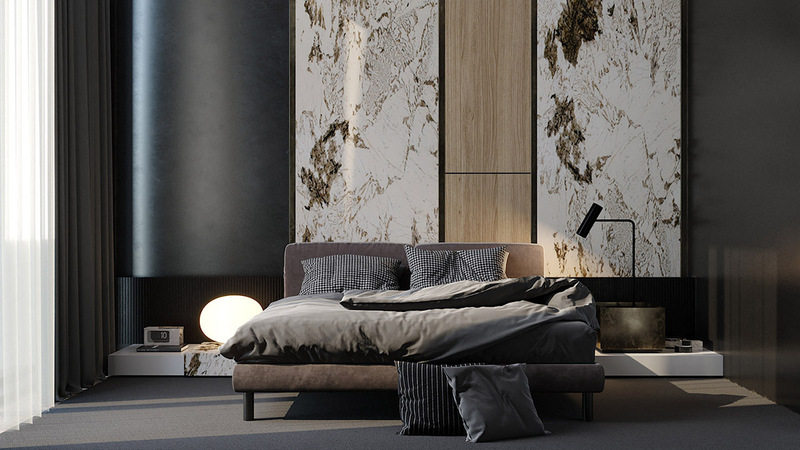 White marble and wood panelling spill into the luxury bedroom design. 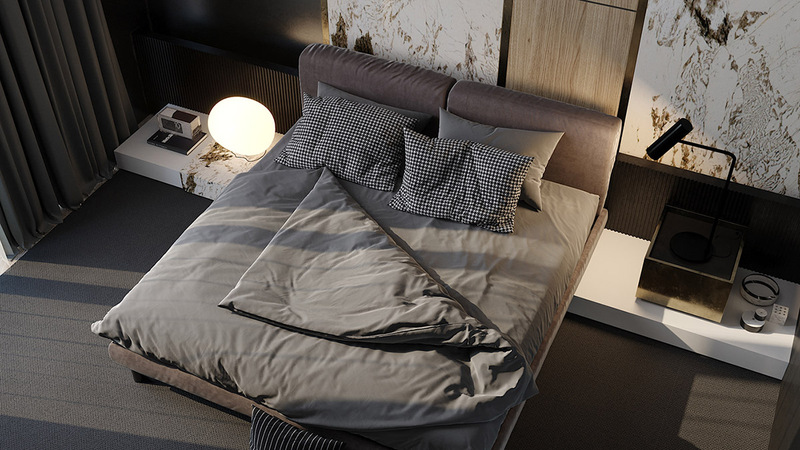 Two bedside table lamps create a cosy glow around a cushiony fabric bed. 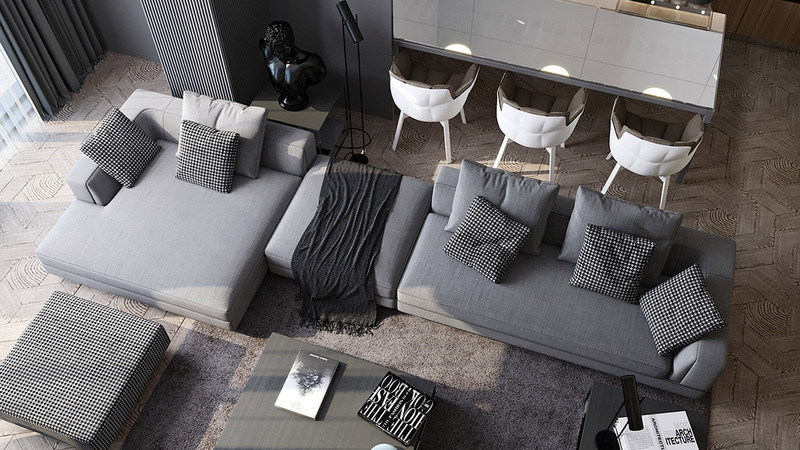 The pillows are clothed in houndstooth fabric to echo the scatter cushions and footstool out in the lounge. 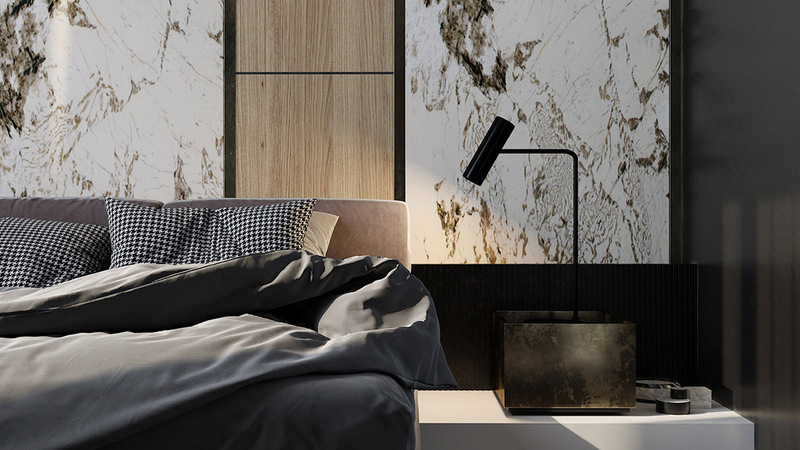 Low level bedside units allow focus to remain on the stunning wall treatment. Black window drapes hang in wait to cosily shroud the sleep space. A houndstooth footstool rests between the living room sofa and the bookcases installed around the tv. LED strip lights dramatically illuminate the dark stacks. 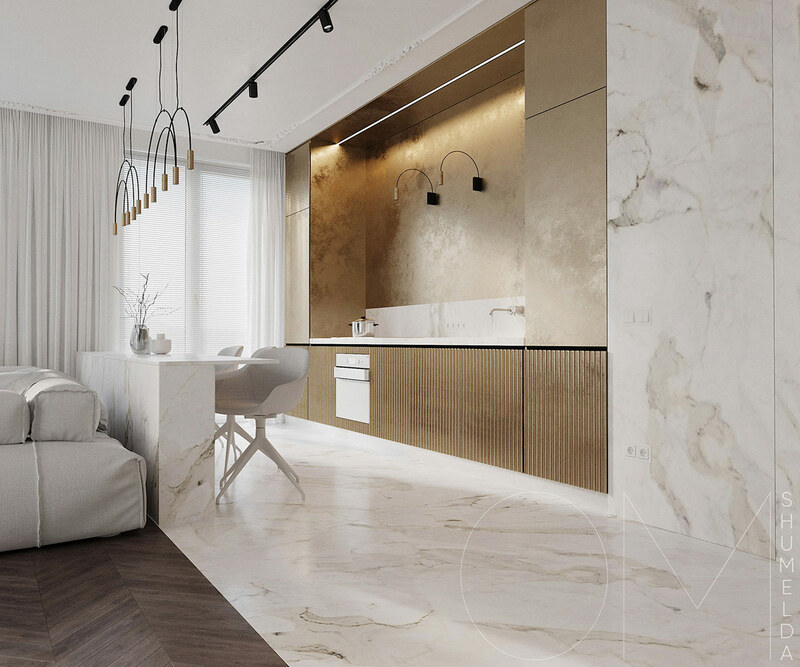 Gold wall tiles carve out an area for use as a small home office.